The global hypopigmentation disorder treatment market is driven by the rise in prevalence of vitiligo. Growth of the market is attributed to increase in awareness about hypopigmentation disorders and rich product pipeline. Hypopigmentation is characterized by patches of skin that are lighter than the overall skin tone. The absence of normal amount of melanin (chemical that gives skin its color) caused by disease, injury, burns, or other trauma could lead to hypopigmentation. Hypopigmentation disorders include vitiligo and albinism. Treatments of this disease include topical drugs, laser therapy, chemical peels, microdermabrasion, and others (phototherapy, etc.). Rise in prevalence of acute hypopigmentation disorders such as vitiligo and albinism is anticipated to increase demand for therapeutics, which in turn is expected to drive the global hypopigmentation disorder treatment market. According to the Global Vitiligo Foundation, currently, 70 million people across the world have vitiligo. Moreover, increase in health care expenditure and rise in the number of clinical trials are expected to propel the global hypopigmentation disorder treatment market. The global hypopigmentation disorder treatment market has been segmented based on treatment, end-user, and region. In terms of treatment, the global market has been classified into topical drugs, laser therapy, chemical peels, microdermabrasion, and others (phototherapy, etc.). The topical drugs segment accounted for major share of the global market in terms of revenue in 2017. The segment is projected to expand at a high CAGR during the forecast period due to increase in the number of patients with hypopigmentation disorders visiting dermatologists and topical drugs being prescribed to these patients. Based on disease indication, the global hypopigmentation disorder treatment market has been categorized into vitiligo, albinism, and others. The vitiligo segment dominated the global market in 2017 due to rise in the number of patients undergoing treatment for vitiligo. In terms of end-user, the global hypopigmentation disorder treatment market has been divided into hospitals, aesthetic clinics & dermatology centers, and others. The aesthetic clinics & dermatology centers segment dominated the global market in 2017. The trend is likely to continue during the forecast period. Factors driving the segment are increase in the number of trained physicians who can perform cosmetic procedures to treat pigmentation disorders and rise in the number of patients with skin pigmentation. In terms of region, the global hypopigmentation disorder treatment market has been segmented into North America, Europe, Asia Pacific, Latin America, and Middle East & Africa. North America dominated the global market in 2017 and is projected to gain market share from 2018 to 2026. The market in North America is driven by increase in incidence of hypopigmentation disorders, new product approvals, strong product pipeline, and rise in health care expenditure. The hypopigmentation disorder treatment market in Asia Pacific is anticipated to expand at a rapid pace during the forecast period. China dominated the market in the region in 2017 due to high population of patients with vitiligo. Major players operating in the global hypopigmentation disorder treatment market include Allergan, SkinCeuticals, Pierre Fabre, Episciences, Inc., RXi Pharmaceuticals Corporation, Obagi Cosmeceuticals LLC (Obagi Medical), and Alvogen. These companies have adopted the strategy of acquisition and collaboration to strengthen their positions in the global market. This report analyzes the current and future scenario of the global hypopigmentation disorder treatment market. Increase in patient population with hypopigmentation disorders, growth of the pharmaceutical industry, improvement in health care infrastructure, and increase in the number of clinical trials are projected to be the major drivers of the global market during the forecast period. The global hypopigmentation disorder treatment market report comprises an elaborate executive summary, which includes a snapshot that provides information about various segments of the market. It also provides information and data analysis of the global market with respect to the segments based on treatment, end-user, and region. A detailed qualitative analysis of drivers and restraints of the market, and opportunities has been provided in the overview section. Additionally, the section comprises competitive matrix and company profiles along with business overview to understand the competitive landscape in the market. This section of the report also provides market attractiveness analysis by region and market share analysis by key players, thereby presenting a thorough analysis of the overall competitive scenario in the global hypopigmentation disorder treatment market. Based on treatment, the global hypopigmentation disorder treatment market has been segmented into topical drugs, laser therapy, chemical peels, microdermabrasion, and others (phototherapy, etc.). The segments have been analyzed based on available drug products used in the treatment of hypopigmentation disorders, cost-effectiveness, and preference for industries. In terms of diseases indication, the market has been classified into vitiligo, albinism, and others. 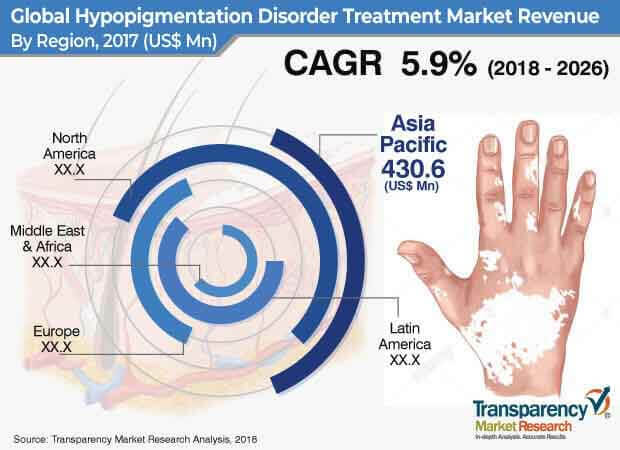 Based on end-user, the global hypopigmentation disorder treatment market has been classified into hospitals, aesthetic clinics & dermatology centers, and others. The market size and forecast for each of these segments have been provided for the period from 2016 to 2026, along with their respective CAGRs for the forecast period from 2018 to 2026, considering 2017 as the base year. In terms of region, the global hypopigmentation disorder treatment market has been segmented into North America (U.S. and Canada), Europe (U.K., Germany, France, Spain, Italy, and Rest of Europe), Asia Pacific (India, China, Japan, Australia & New Zealand, and Rest of Asia Pacific), Latin America (Brazil, Mexico, and Rest of Latin America), and Middle East & Africa (South Africa, GCC Countries, Israel, and Rest of Middle East & Africa). The market size and forecast for each of these regions and the mentioned countries/sub-regions have been provided for the period from 2016 to 2026, along with their respective CAGRs for the forecast period from 2018 to 2026, considering 2017 as the base year. The research study also covers the competitive scenario in these regions. The report also profiles major players in the global hypopigmentation disorder treatment market based on various attributes such as company overview, financial overview, product portfolio, business strategies, and recent developments. The major players profiled in the market report include Allergan, SkinCeuticals, Pierre Fabre, Episciences, Inc., RXi Pharmaceuticals Corporation, Obagi Cosmeceuticals LLC (Obagi Medical), and Alvogen.